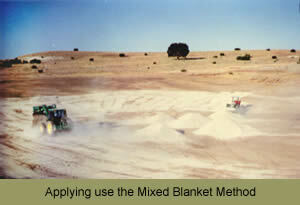 The Mixed Blanket Method may be used for seepage control in new ponds, reservoirs, sewage lagoons or in old ones that can be drained. When this method is used, no specialized equipment is necessary. Clear the area of all rocks and vegetation and then smooth the surface. In situations where there has been erosion, we recommend to disc or roto-till the area 2" - 3" deep after smoothing. Then apply our Granular Sodium Bentonite at the recommended rate (pounds per sq. ft. for your particular soil type). This can be done with a mechanical dry fertilizer spreader with controlled distribution or a front-end loader, etc. After the distribution has been completed, then thoroughly mix the Sodium Bentonite and soil with a disc or roto-tiller to a depth of no greater than 1" - 2". To disc or roto-till the soil and Bentonite mixture to a greater depth than 2" will reduce and dilute the recommended amount of Sodium Bentonite per sq. ft. unless of course the greater depth was taken into consideration. After the Sodium Bentonite and soil have been thoroughly mixed, then tamp it down or go over the distribution area with your present equipment. After this step, if at all possible, we like to use sprinklers and wet this area. This allows the Bentonite to absorb the moisture and bond with the surrounding soil. After this has been completed, than allow water to flow gently into the reservoir, lake, pond, etc. and fill. The effectiveness of this method becomes complete after approx. 60 - 90 days. In all methods of Sodium Bentonite application, it's the swelling of the particles that stop the leak. Sodium Bentonite will not stop the leak immediately. Some seepage is to be expected for up to 60 and 90 days after the Sodium Bentonite is applied. Generally, the leak is stopped or at least slowed within 45 days but, due to underlying circumstances such as rocks, roots and underground springs, some ponds require more Sodium Bentonite than the recommended amount. Some ponds, due to poor site selection, improper design and poor construction, may never seal completely. Therefore, we cannot guarantee this product. 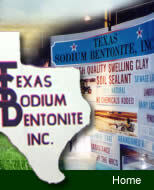 It is essential to use the recommended amount of sodium bentonite per square foot based on your soil type and the size of area you are trying to cover. Also, an even application ensures an impenetrable bentonite liner. Proud Member of the WE LOVE TEXAS Network, Supporting Texas-based Small businesses!